Even though the current time and date can be checked from your system's calendar which is located in the system tray, this calendar cannot be customized and personalized. Eusing Clock is a small desktop clock application that will place a great looking, colorful clock on the screen of your computer. With Eusing Clock, you'll be able to not only see your local time, but also the time in cities and countries across the globe. It enables you to quickly customize the looks, time format and standard as well as the background opacity level. With Eusing Clock on your system, you will get a really impressive desktop clock application that is not only good at telling you the correct time but also comes with a really beautiful interface. The best thing is that you can even modify it to your liking. Besides having a standard time, day and date display, Eusing Clock also offers three different colored meters which will fill up as the hours, minutes and seconds go by. These will brighten up your desktop and give your clock a very interesting and futuristic look. And while there are only 24 hours in a day, Eusing Clock achieves the near-impossible by letting you set an astounding 128 alarm times across all time zones, complete with your own WAV sound file or the default sound. The alarms in Eusing Clock are not just designed to wake you up. In fact, with Eusing Clock, you can set alarms to display messages, shut down or restart your computer, and more. Enjoy the flexibility and fun of changing the clock size and color, too. The settings that Eusing Clock provides will allow you to make sure that its window always stays on top, to determine the time format (12 or 24 hours) and the time standard, to enable or disable the clock scale display and to add the program to the Windows startup list. 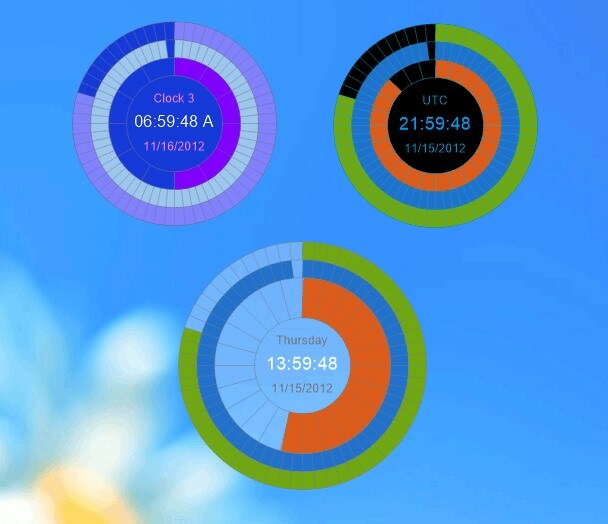 Simply put, Eusing Clock is a light-weight, simple and handy piece of software that will quickly add a beautiful looking clock to your desktop. Changes: Bug fixes and stability improvements.